I cordially greet and congratulate you on the significant date – your 90th birthday. How many are your works, Lord! In wisdom you made them all (cf. 104, 24). Today, in reflecting on your life journey and being filled with gratitude to All-Merciful God for His abundant mercies, you, too, can repeat these inspired words of the Psalmist King. Your personal and religious development fell on the very difficult time when our Church suffered persecution and deprivation while the Orthodox faith was subjected to oppression and profanation. But in all these difficult situations in your life and ministry, you have always been a true disciple of Christ and faithful witness to the Truth. The Creator, seeing you zeal for God’s cause, ordained that you accept the lot of apostleship and entrusted the Estonian flock to your care. For nearly half a century, you, with your characteristic humbleness and modesty, have borne the cross of archpastorship, seeing to it that the people are educated for love of the Lord and the neighbour and asserting the eternal spiritual and moral values in the land of Estonia. 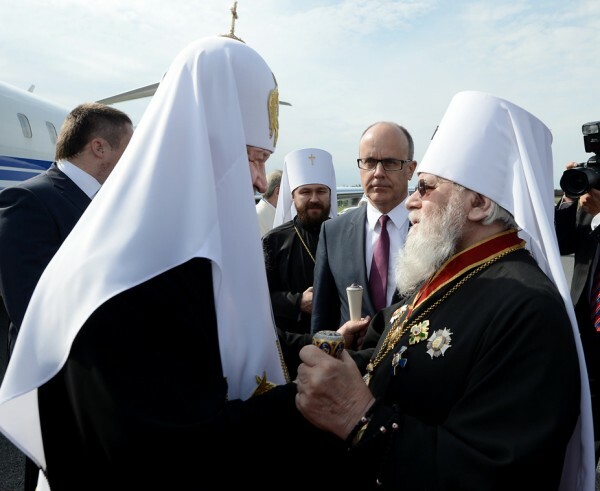 In recognition of your zealous service and on the occasion of the significant date you are marking today, I believe it fair to award you the Order of the Holy Prince Vladimir Equal-to-the-Apostles (Class I). I prayerfully wish you physical and spiritual strength, inexhaustible joy in Christ the Saviour and His grace-giving help in your further work for the glory of God and the good of the Holy Church.